For every single aspect of sport, there is a natural evolution. Training constantly evolves to help athletes be faster, stronger, and healthier than we’ve ever seen. Nutrition is constantly evolving to allow athletes to be in peak physical condition while giving their body the perfect type of fuel to succeed on the pitch. Even the equipment for sports is in a constant state of evolution, changing and moving forward to ensure that every moment spent playing the world’s game is done at as elite a level a player can reach. With that evolution, one of the greatest areas of change we’ve seen over the last five years, in terms of soccer equipment, is gear related to the short-sided part of the game. Despite this constant flow of evolution, the true owner of the short-sided crown has always been the Swoosh. For years, Nike has absolutely dominated the market for turf and indoor specific shoes. Even in the world of lifestyle wear, all signs pointed toward Nike being top dog. However, the last few years has seen adidas attempting to wrestle the mantle away from Nike. A strong showing in lifestyle footwear has spilled over into success within the short-sided market and it is increasingly obvious, adidas isn’t messing around. Their newest introduction into the space is the adidas X18+ Tango, and this Boost-powered spaceship looks destined to turn heads. adidas has certainly decided to give the X18+ Tango a decent amount of intrigue. Even with a blackout colorway drop under their belt, they still managed to make the boot seem like something you want to hold in your hands and inspect. Whether you go with the bright yellow eye-searing colorway, the crisp cleanliness of the whiteout, or decide to have your newest toy float under the radar with the blackout, X 18+ Tango just has a special air about it. It’s not much of a shock that the silo that can easily lay claim to being the brand’s flashiest item over the last several years continues to divide opinion. 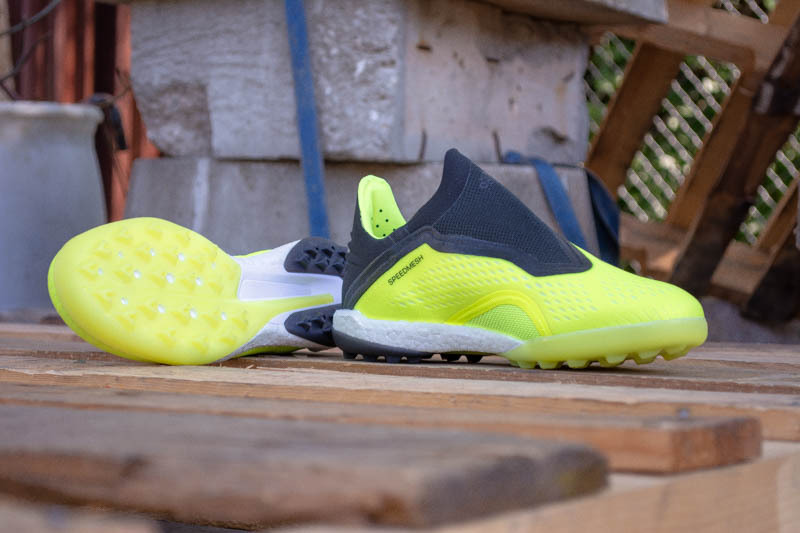 However, even with the Boost under the heel, it feels like the most streamlined small-sided shoe to hit the market in some time. The first thing that jumps out at you and anyone else who glances at your feet is the lack of laces. 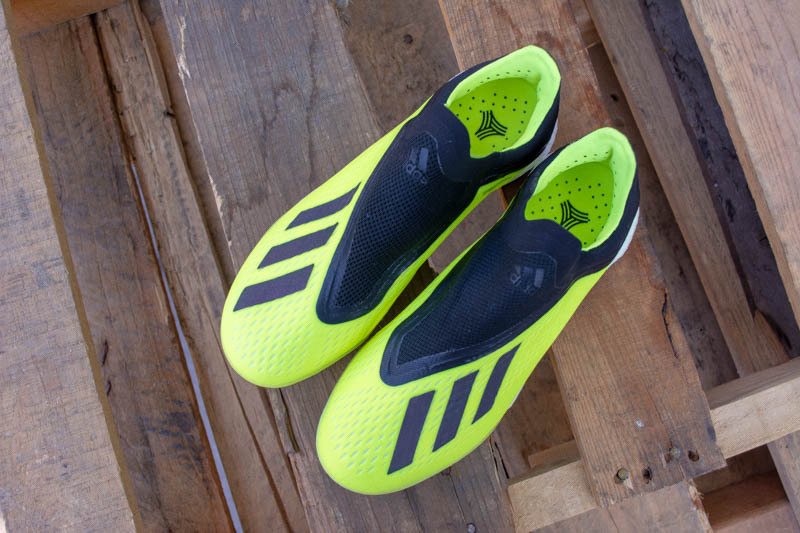 It gives this boot the most aerodynamic look possible, with zero ridges (like the Predator) and a smooth and seamless looking upper (in contrast to the pattern on the Nemeziz). It’s the type of boot that would be fun to stick into a wind tunnel, and it’s an enjoyable and unique look. The only complaint from me is that I wish adidas would start coloring the Boost material to either match or blend with the shoe. I understand wanting one of your prized technologies to shine, but the stark white of the Boost takes away from the blackout and Solar Yellow option though of course I recognize that many others find that attractive. One of the biggest surprises with the X 18+ Tango is the lack of any type of bag to carry your boots, especially given the fact that the Predator Tango (listed at a very similar price point) does come with a bag. It also opts out of including any type of shoehorn (something the Predator also offers), but the build of the boot makes the need for a shoehorn unnecessary. The underside of the Tango showcases a very unique turf set-up with arrow-like small studs covering the bulk of the sole, a midfoot reminiscent of an old Torsion plate, and a few small holes of exposed Boost. After having run the gauntlet through all of the other short-sided options on the market, it’s always interesting when something built for longevity on turf has such a thin upper. Given that, we couldn’t wait to head out to the turf, slip the Tango on, and go to town. 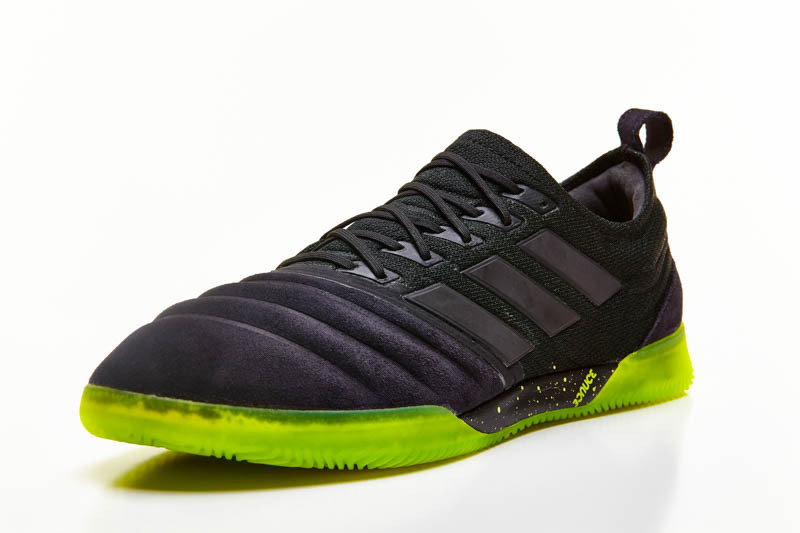 If the X couldn’t make the shift to the faster paced playing style of a short-sided game without bringing the benefit associated with the upper, then this might be disaster from the word “go.” In order to craft a winner, adidas is going to have to make sure that the X Tango is ready to provide form and function at the highest speeds. On a boot without laces, the first attribute that you’d really be hoping to find is a premium touch on the ball. Considering that this is the type of boot that advertises a close touch to one and all, it would be a supreme failure if the boot was unable to have you sit as close to the ball as possible. Luckily, the Three Stripes have crafted a boot that might be one of the thinnest short-sided boots we’ve ever used. With the heftier futsal ball sometimes tending to make any touch during intricate movements of play to feel dull and labored, the adidas X18 Tango actually makes time with either a futsal or normal size 5 ball feel smooth and simple. Perhaps one of the most intriguing items about this boot is that the Tango version of the X 18+ sits a bit closer to the laced X 18.1 FG version than the laceless 18+ FG version in terms of the upper. This also plays a factor in the Tango version being a bit thicker than the standard 18+, but that’s not something that negatively changes how the ball feels at your feet. The upper is uniform across the entirety of the boot, and any passing, shooting, or dribbling is going to offer the same nice, plush padded feel that the X has been perfecting for the last few versions. Striking the ball with power provides that immediate ping that you’re looking for with boots of this build, all while getting a benefit of the padding that keeps the X near the top of the boot heap. Receiving those quick zipped passes or trying to quickly put a ball in dangerous areas benefits greatly from the slight padding, as the right technique makes sure that the ball doesn’t jump too far away and allow someone to take possession from you. 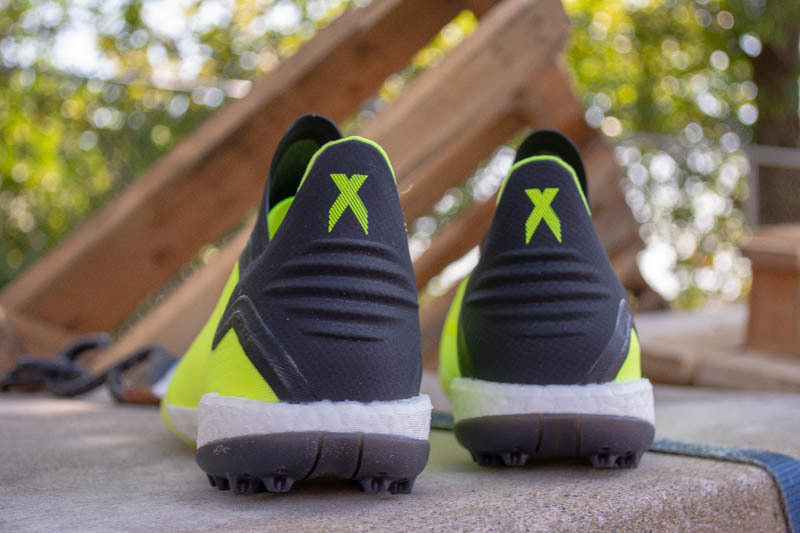 Getting underneath the ball or trying a small chip or scoop is incredibly simple with the X Tango, as the boot is made to have your forefoot be as low as possible while still accommodating the thick turf outsole that can sometimes plague turf options. Having tested the Predator Tango, this boot feels a bit less bulky, a bit lower to the ground, and more attuned to trying quick cuts in and out than having the devastating power of the Predator Tango. 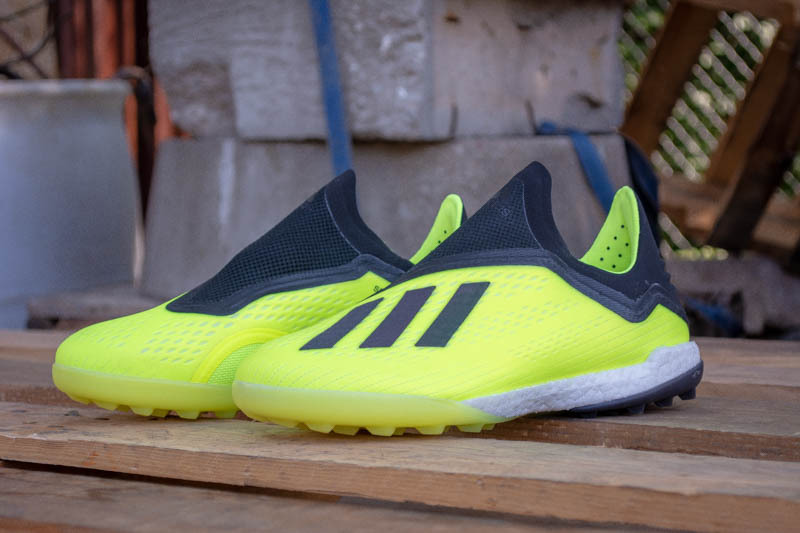 It’s also been interesting to see the X Tango hold up extremely well to the abrasive nature of turf, and made even more impressive by the fact that (unlike the Pred Tango and almost every Nike short-sided option) there aren’t any areas of the boot that adidas has either altered for durability or added a thick coating to prevent turf from destroying the upper. We’re about a month into testing with these, and they look ready for several more months of turf toughness. The negative that continues to nag laceless adidas boots is that, during testing, there have been dozens of moments where a quick plant or cut resulting in my foot rolling over more than I would have expected for such an elite option. 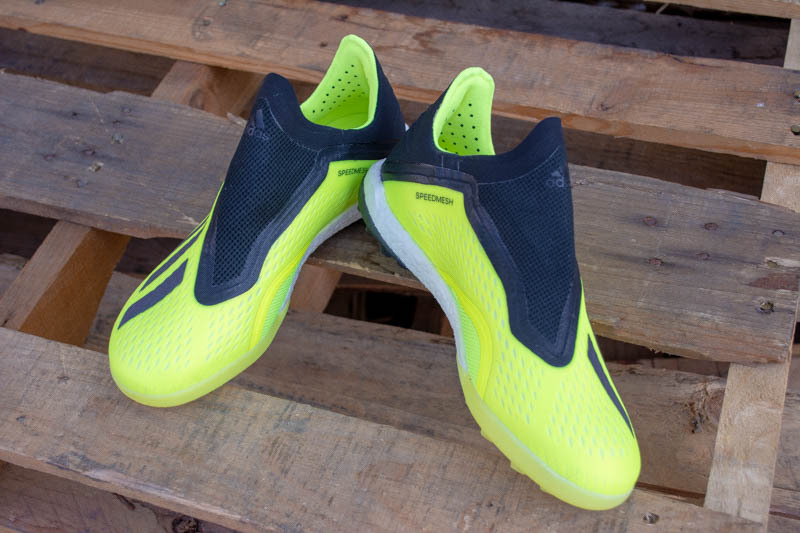 In order to have the soft upper with a great touch available, it seems that the X Tango might be one of the biggest victims to our laceless worries: lockdown. It isn’t like we felt like we were slipping and sliding or constantly terrified of a rolled ankle, but there have been multiple moments where it was quite obvious that the boot had rolled a bit more than what we demand from our top-tier options. 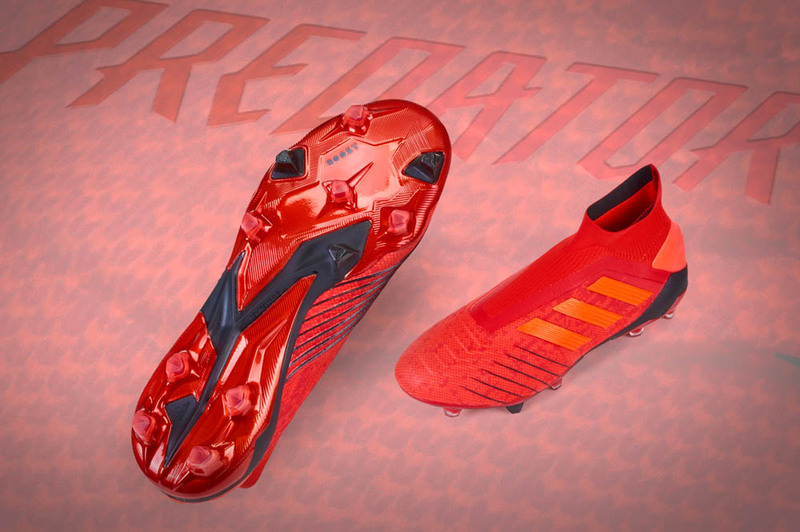 Why did adidas ditch the rigid sides of the X 18+ FG or why didn’t they make something different to aid with lockdown? However, it’s a not negative that keeps us from forcing you to run out and snag one of these boots immediately. The sole has a pattern that has been perfect for all the short-sided fixtures that we’ve thrown at it. The small, stud-like nubs across the bottom are a material that allows this boot to perform a great function on turf and on any indoor surface. Even playing on wet turf, while other were slipping and sliding on turf pellets and water, I was able to focus exclusively on the task at hand. Much like its FG compatriot, the X 18+ Tango really has an impressive level of comfort for this style of boot. 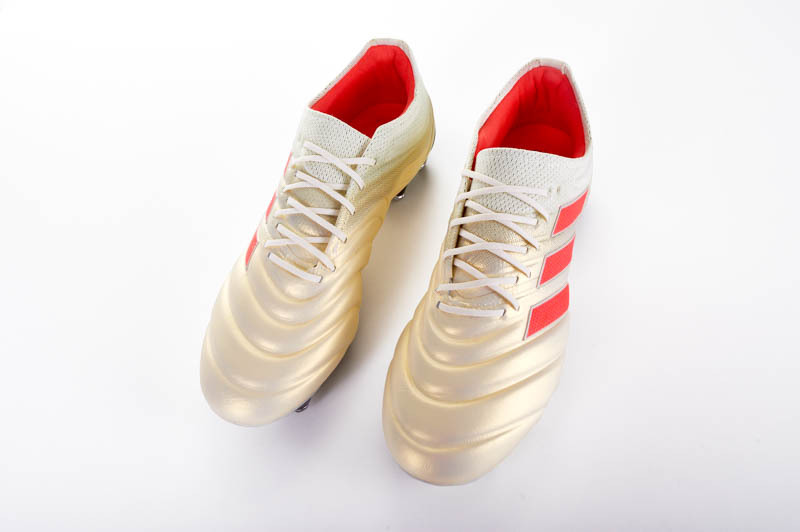 From the outside, it might look like its been stripped down to a super-thin sleeve, but adidas has provided this bad boy with all the right padding in all the right places. Slipping your foot in provides a nice firm squeeze around the entirety of the boot. You actually feel surprisingly locked in despite the lack of laces, which all comes down to the elasticized band running right underneath where the laces would normally sit. This provides the dual function of keeping your foot sitting down on the sole, adding as much lockdown as it can, and helping keep the boot snug to your foot so that (as we mentioned) your touch can be as close to the ball as possible. Unlike the FG version, I found that the Tango actually performed highly and without issue throwing the boot straight into the fray right after the boot arrived on my doorstep. I didn’t have any hotspots or blisters, and I think that it’s because the inner sleeve construction differs a bit from the rigid nature of the FG version. I also think that the addition of the adidas Boost element really helps. While the Boost that adidas has started attaching to all of its boots has seemed more like an advertising ploy than actual positive developments for the brand’s products, the Boost on the X18+ Tango actually feels like something that elevates the Tango into the elite world of short-sided options. It provides a nice cushion in the heel and feels like the perfect element to counter really stiff concrete that some facilities either employ in their indoor games or underneath lower quality turf. Perhaps this can be attributed to actually giving a nice thick layer of the material under the Tango, something that other Boost power soccer products haven’t quite achieved. This also helps keep you from feeling heavy on your feet and helps keep you naturally positioned on your toes – ready to attack the ball. I will say, of all the laceless options available, the X 18+ Tango seems to be the most accommodating release for wider feet. However, when it comes to sizing, I’d say to stick true to size. The X18+ Tango sits at the absolute height of price points for short-sided gear. At $160, there are other quality options that you could buy two times over before reaching that price. As with most top-notch gear, this is going to come down purely to whether you think that the price is worthwhile. 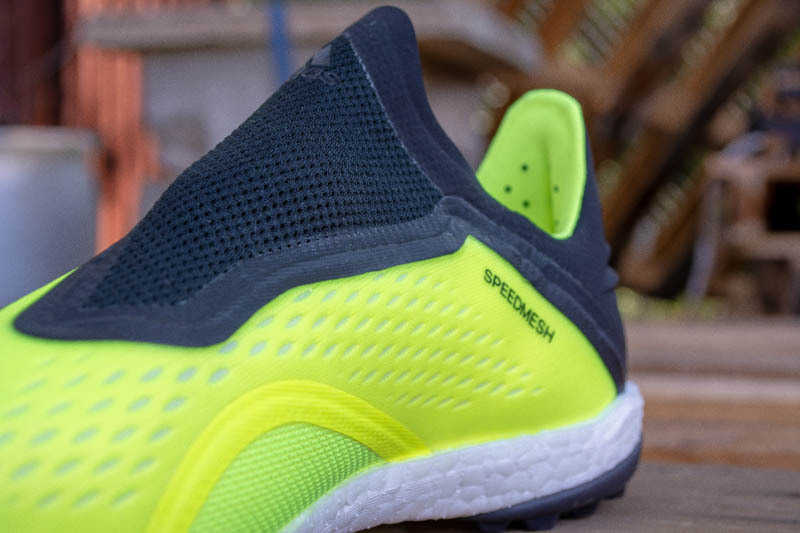 If you’re in the market for the best laceless or lightweight option, then you would be hard pressed to find something better. If $160 is what you feel comfortable spending on your next turf or indoor shoe, the X18+ Tango should be battling for the top spot on your list. A fantastic short-sided option, but a few too many times where our feet seems to roll a bit on quick cuts keeps us from proclaiming this as the best boot available. The fit is impressive, the comfort is there, and your time on the ball shows why fans have been excited about this faux-F50. 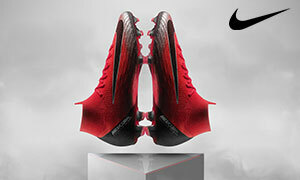 It’s a new arena of competition for thin boots that are crafted for use inside or on turf, but Nike and adidas are certainly swinging hay-makers to try and take the top spot. However, until adidas either solves the seemingly impossible task of creating perfect lockdown without laces OR slaps laces on their best and brightest, they’ll struggle to be the very best and top Nike.